So when Dumpling Daughter’s website calls its food “authentic Chinese homestyle fare,” the two-location restaurant is really telling you that their menu is based on well-made versions of food from Chinese homes — or at least owner Nadia Liu Spellman’s childhood home-away-from-home: her parents’ restaurants. You’ll find spring rolls, dumplings, buns, noodles, and big, substantial soup bowls. Spellman’s parents, Sally Ling and Edward Nan Liu, ran several establishments, called Sally Ling’s, in the Boston area. The original location, next to the former Jasper’s, on the Waterfront, was high-end and elegant. Spellman had another idea. Her two places, a small one in Weston Center with 32 seats, and a new, larger spot in Kendall Square, Cambridge, next to the Broad Institute, with 48 seats, fall under the fast-casual category (restaurant-industry jargon). They’re set up so you order at a counter and a runner brings your meal. Her clientele is largely Asian, she says, which delights her. She’s noticed that many Chinese students at the Kendall location are from China. “I want them to have food they identify with,” she says. They’ll certainly have food that’s delicious. Pan-seared pork and Napa cabbage dumplings, six to an order, are hot and juicy with crispy sides. They come with a house ginger-soy sauce. Among the traditional bun fillings is barbecued pork inside tender, pleated, puffy cases. Dip these into inky Chinese black vinegar, which has Worcestershire qualities, and is offered with chile sauce and plum sauce beside the napkin and chopstick canisters. Grandma’s Beijing meat sauce over noodles, with lean pork and tofu, is one of those dishes that you can’t stop eating from the first bite. It’s salty and sweet and caramelized; strips of cucumber sit on the noodles and sauce and it’s a delightful bowl. Giant roll-ups here begin with crispy scallion pancakes (emphasis on crispy), filled with beef shank, egg, or tofu. “Kendall Square fried rice bowl” has everything: aromatic rice, kimchee, cucumbers, fried egg with sriracha, aioli, and pork sung, which is pork that is dried and shredded finely. Spellman calls it “cured pork, with a cotton-candy texture.” Break the yolks into the rice, sprinkle on the pork sung, get a bite of kimchee heat or aioli, and you’ll be set for the afternoon. But not before you duck into the space next door, Vester, run by Spellman’s sister, Nicole Liu, for some outstanding chocolate-chip cookies, fudgy brownies, and little crisp butter cookies (there’s a full breakfast and lunch menu, too). 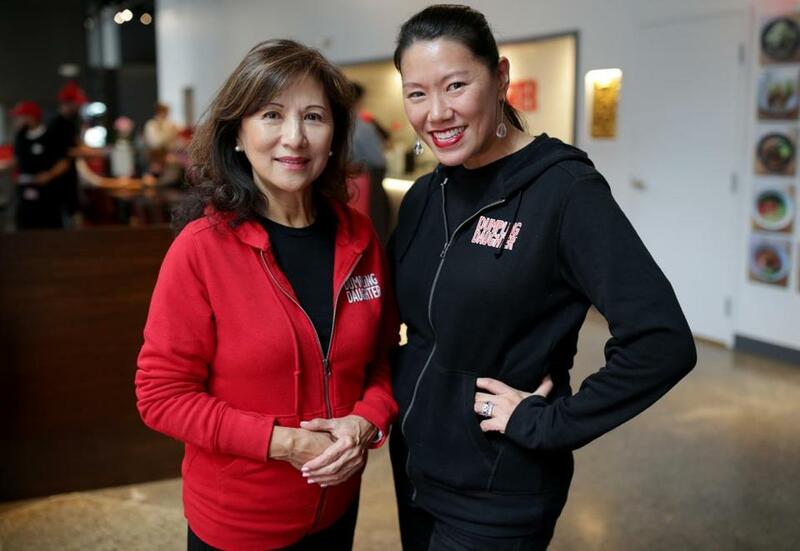 The sisters took over the premises that were available when Tse Wei Lim and Diana Kudayarova closed Ames Street Deli and Study. Dumpling is lively and crowded by day, but the place at night (it’s open till 8 p.m.) is practically empty, as are many Kendall establishments that are not full-scale restaurants with bars. The area has its growing pains, but no one wants to see restaurants like this shut tight after mid-afternoon. Come back when the sun goes down and you want something steamy and satisfying. 73 Ames St., Kendall Square, Cambridge, 617-577-8886, www.dumplingdaughter.com.